The village of Kaʻawaloa was at the north end of the bay in ancient times, where the Puhina O Lono Heiau was built, along with some royal residences. The name of the village means "the distant Kava", from the medicinal plant used in religious rituals. The name of the bay comes from ke ala ke kua in the Hawaiian Language which means "the god's pathway." This area was the focus of extensive Makahiki celebrations in honor of the god Lono. Another name for the area north of the bay was hale ki'i, due to the large number of wood carvings, better known today as "tiki". Although there are theories that Spanish or Dutch sailors might have stopped here much earlier, the first documented European to arrive was Captain James Cook. He and his crews on the Resolution and Discovery sighted Kealakekua Bay on the morning of January 17, 1779. He estimated several thousand people lived in the two villages, and many thousand more in the surrounding areas. On January 28, he performed the first Christian service on the islands, for the funeral of a crew member who had died. Cook had entered the bay during Makahiki a traditionally peaceful time. Cook and his men were welcomed, given much food and gifts from the island and treated as honored guests. John Ledyard, the only American on board Cook's third voyage, gives a detailed account of these events in his journals. Cook and his crew stayed for several weeks, returning to sea shortly after the end of the festival. After suffering damage to the mast during a storm, the ships returned two weeks later on February 12. This time, already fraying relations came to a head. One of Cook's captains accused a native chieftain of stealing the Resolution's jolly boat. The boat was soon found unstolen and the native chief soured from the false accusation. Cook himself attempted to barter for the wood used to border the natives "Morai" or sacred burial ground for certain high-ranking individuals. The native chiefs were mortified at this offer and refused to accept it. Cook later took the wood anyway, against the will of native chieftains. With a damaged mast, fraying relations with the natives and being heavily outnumbered, Cook attempted to lure Hawaiian chief Kalaniʻōpuʻu aboard his ship to hold him hostage in order to induce 'good behavior among the natives.' Tensions mounted as Cook attempted to trick the chief, and natives surrounded the beach. Cook fired the first shot, and his men quickly shot several more natives. As Cook and his men attempted to retreat, Cook was stabbed through the chest by a native chief with an iron dagger which had been traded from Cook's own ship previously in the same visit. The majority of Cook's body was never recovered. 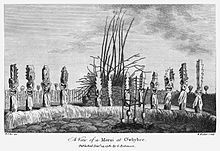 Since Cook's men felt they could not leave without resupplying fresh water and further repair of their damaged mast, they shot dozens more natives with their own muskets and the ships cannons and burned a portion of Kireekakooa, one of the towns in the bay. Cook's death was depicted in a series of paintings called Death of Cook. The monument is accessed by a one-hour hike from the road or by crossing the bay by boat. When Kalaniʻōpuʻu died in 1782, his oldest son Kiwalaʻo officially inherited the kingdom, but his nephew Kamehameha I became guardian of the god Kūkaʻilimoku. A younger son, Keōua Kuahuʻula, was not happy about this and provoked Kamehameha. Their forces met just south of the bay at the battle of Mokuʻōhai. Kamehameha won control of the west and north sides of the island, but Keōua escaped. It would take over a decade to consolidate Kamehameha's control. In 1786, merchant ships of the King George's Sound Company under command of the maritime fur traders Nathaniel Portlock and Captain George Dixon anchored in the harbor, but avoided coming ashore. They had been on Cook's voyage when he was killed by natives. In December 1788, the Iphigenia under William Douglas arrived with Chief Kaʻiana, who had already traveled to China. The first American ship was probably the Lady Washington around this time under Captain John Kendrick. Two sailors, Parson Howel and James Boyd, left the ship (in 1790 or when it returned in 1793) and lived on the island. In March 1790, the American ship Eleanora arrived at Kealakekua Bay and sent a British sailor ashore named John Young, to determine whether the sister ship, the schooner Fair American, had arrived for its planned rendezvous. Young was detained by Kamehameha's men to prevent the Eleanora's Captain Simon Metcalfe from hearing the news of the destruction of the Fair American, and the death of Metcalfe's son, Thomas Humphrey Metcalfe, after the massacre at Olowalu. Young and Isaac Davis, the lone survivor of the Fair American, slowly adjusted to the island lifestyle. They instructed Hawaiians in the use of the captured cannon and muskets, becoming respected advisers to Kamehameha. In 1791 Spanish explorer Manuel Quimper visited on the ship Princess Royal. George Vancouver arrived in March 1792 to winter in the islands with a small fleet of British ships. He had been a young midshipman on Cook's fatal voyage 13 years earlier and commanded the party that attempted to recover Cook's remains. He avoided anchoring in Kealakekua Bay, but met some men in canoes who were interested in trading. The common request was for firearms, which Vancouver resisted. One included chief Kaʻiana, who would later turn against Kamehameha. Vancouver suspected Kaʻiana intended to seize his ships, so left him behind and headed up the coast. There he was surprised to encounter a Hawaiian who in broken English introduced himself as "Jack", and told of traveling to America on a fur-trading ship. Through him, Vancouver met Keʻeaumoku Pāpaʻiahiahi, who gave him a favorable impression of Kamehameha (his son-in-law). He spent the rest of the winter in Oʻahu. Vancouver returned in February 1793; this time he picked up Keʻeaumoku and anchored in Kealakekua Bay. When Kamehameha came to greet the ship, he brought John Young, now fluent in the Hawaiian language, as an interpreter. This greatly helped to develop a trusted trading relationship. The Hawaiians presented a war game, which was often part of the Makahiki celebration. Impressed by the warriors' abilities, Vancouver fired off some fireworks at night to demonstrate his military technology. Vancouver presented some cattle which he had picked up in California. They were weak and barely alive, so he convinced Kamehameha to avoid killing them for ten years. Scottish doctor James Lind had recommended the use of citrus juice to prevent scurvy on long voyages. The botanist Archibald Menzies had picked up some citrus fruit seeds in South Africa, and dropped them off here, so that future ships might be able to replenish their stocks at the Hawaiian islands. Vancouver left in March 1793 after visiting the other islands to continue his expedition, and returned again January 13, 1794. He still hoped to broker a truce between Kamehameha and the other islands. His first step was to reconcile Kamehameha with Queen Kaʻahumanu. He dropped off more cattle and sheep from California, and discovered a cow left the year before had delivered a calf. The cattle became feral and eventually became pests. They were not controlled until the "Hawaiian Cowboys," known as the Paniolo, were recruited. The ship's carpenters instructed the Hawaiians and the British advisers how to build a 36-foot (11 m) European-style ship, which they named the Britania. On February 25, 1794, Vancouver gathered leaders from around the island onto his ship and negotiated a treaty. Although this treaty was sometimes described as "ceding" Hawaii to Great Britain, the treaty was never ratified by the British parliament. For the next few years, Kamehameha was engaged in his war campaigns, and then spent his last years at Kamakahonu to the north. By this time other harbors such as Lahaina and Honolulu became popular with visiting ships. By 1804, the heiau was falling into disuse. In 1814, a British ship HMS Forester arrived in the midsts of a mutiny. Otto von Kotzebue arrived in 1816 on a mission from the Russian Empire. When Kamehameha I died in 1819, his oldest son Liholiho officially inherited the kingdom, calling himself Kamehameha II. His nephew Keaoua Kekuaokalani inherited the important military and religious post of guardian of Kūkaʻilimoku. However, true power was held by Kamehameha's widow Queen Kaʻahumanu. She had been convinced by Vancouver and other visitors that the European customs should be adopted. In the ʻAi Noa she declared an end to the old Kapu system. Kekuaokalani was outraged by this threat to the old traditions, which still were respected by most common people. He gathered religious supporters at Kaʻawaloa, threatening to take the kingdom by force, as happened 37 years earlier. After a failed attempt to negotiate peace, he marched his army north to meet Kalanimoku's troops who were gathered at Kamakahonu. They met in the Battle of Kuamoʻo. Both sides had muskets, but Kalanimoku had cannon mounted on double-hulled canoes. He devastated the fighters for the old religion, who still lie buried in the lava rock. The wood Kiʻi carvings were burned, and the temples fell into disrepair. A small Christian church was built in 1824 in Kaʻawaloa by the Hawaiian missionaries, and the narrow trail widened to a donkey cart road in the late 1820s, but the population declined due largely to introduced diseases and people shifted to other areas. In 1825, Admiral Lord Byron (cousin of the famous poet) on the ship HMS Blonde erected a monument to Cook and took away many of the old, sacred artifacts. The last royalty known to live here was high chief Naihe, known as the "national orator," and his wife Chiefess Kapiʻolani, early converts to Christianity. In 1829, she was saddened to see that the destruction of the temples included desecrating the bones of her ancestors at the Puʻuhonua o Hōnaunau. She removed the remains of the old chiefs and hid them in the Pali Kapu O Keōua cliffs before ordering this last temple to be destroyed. The bones were later moved to the Royal Mausoleum of Hawaii in 1858, under direction of King Kamehameha IV. In 1839 a massive stone church was built just south of the bay. It fell into ruin, and a smaller building called Kahikolu Church was built in 1852. This also fell into ruin, but has been rebuilt. In 1894 a wharf was constructed at the village at the south of the bay, now called Napoʻopoʻo. A steamer landed in the early 20th century when Kona coffee became a popular crop in the upland areas. 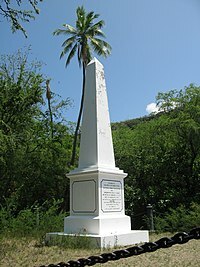 A large white stone monument was built on the north shore of the bay in 1874 on the order of Princess Likelike and was deeded to the United Kingdom in 1877. The chain around the monument is supported by four cannon from the ship HMS Fantome; they were placed with their breaches embedded in the rock in 1876. It marks the approximate location of Cook's death. It is located at coordinates 19°28′52.7″N 155°56′0.4″W﻿ / ﻿19.481306°N 155.933444°W﻿ / 19.481306; -155.933444﻿ (Captain James Cook Monument). The Cook monument is unreachable by road; this remote location is accessible only by water or an hour-long hike along a moderately steep trail. Many visitors have rented kayaks and paddled across the bay, about 1.5 miles (2.4 km) from its southern end. State conservation regulations prohibit kayaks, stand-up paddleboards, surfboards, and bodyboards from entering the bay unless part of a tour with a licensed local operator. The pier at Napoʻopoʻo can be accessed down a narrow road off the Hawaii Belt Road. The beach sand was mostly removed by Hurricane Iniki in 1992. Boat tours are also available, leaving from Honokōhau harbor, Keauhou Bay, and the Kailua pier. A short single-day eruption of Mauna Loa volcano took place underwater within Kealakekua Bay in 1877, and within a mile of the shoreline; curious onlookers approaching the area in boats reported unusually turbulent water and occasional floating blocks of hardened lava. Hawaiian Spinner Dolphins frequent Kealakekua Bay, especially in the morning. The bay serves as a place for them to rest and feed, and as a nursery for mothers and their calves. Due to the calm water conditions, extensive coral reef, and thriving underwater life, Kealakekua Bay offers some of the best snorkeling and diving in Hawaii, especially in the shallow waters adjacent to the monument. The bay is a protected marine environment so visitors can snorkel but no fishing is allowed in this area. About 180 acres (0.73 km2) around the bay was designated a State Historic Park in 1967, and it was added as a Historic District to the National Register of Historic Places in 1973 as site 73000651. The 315 acres (1.27 km2) of the bay itself were declared a Marine Life Conservation District in 1969. A narrow one-lane road to the south leads to Puʻuhonua o Hōnaunau National Historical Park, which contains more historic sites. In Arthur C. Clarke's book Rendezvous with Rama, Kealakekua Bay is mentioned as a place where Bill Norton, the Commander of the Space Survey Vessel Endeavour, visited. The 1933 song "My Little Grass Shack in Kealakekua, Hawaii" mentions the state fish which can be found in the bay: the Humuhumunukunukuapuaʻa (Reef triggerfish). ^ B. Jean Martin (September 30, 1971). "Kealakekua Bay Historical District nomination form". National Register of Historic Places. National Park Service. Retrieved 2009-11-23. ^ "Coral Reef Network". coralreefnetwork.com. ^ Lloyd J. Soehren (2010). "lookup of Palikapuokeoua ". in Hawaiian Place Names. Ulukau, the Hawaiian Electronic Library. Retrieved November 17, 2010. ^ John R. K. Clark (2004). "lookup of Kaʻawaloa ". in Hawai'i Place Names: Shores, Beaches, and Surf Sites. Ulukau, the Hawaiian Electronic Library, University of Hawaii Press. Retrieved November 17, 2010. ^ Lloyd J. Soehren (2010). "lookup of Kaʻawaloa ". in Hawaiian Place Names. Ulukau, the Hawaiian Electronic Library. Retrieved November 17, 2010. ^ Lloyd J. Soehren (2010). "lookup of Kealakekua Bay ". in Hawaiian Place Names. Ulukau, the Hawaiian Electronic Library. Retrieved November 17, 2010. ^ Lloyd J. Soehren (2010). "lookup of Halekii ". in Hawaiian Place Names. Ulukau, the Hawaiian Electronic Library. Retrieved November 17, 2010. ^ a b c d Henry B. Restarick (1928). "Historic Kealakekua Bay". Papers of the Hawaiian Historical Society. Honolulu: The Bulletin Publishing Company. hdl:10524/964. ^ a b c d Cummins Speakman and Rhoda Hackler (1989). "Vancouver in Hawaii". Hawaiian Journal of History. Hawaiian Historical Society, Honolulu. 23. hdl:10524/121. ^ Hiram Bingham I (1848). A Residence of Twenty-one Years in the Sandwich Islands. Sherman Converse, New York. ^ Rufus Anderson (1865). Hawaiian Islands:Their Progress and condition under missionary labors. Gould and Lincoln. ^ Lois M. Humphrey (May 26, 1982). "Kahikolu Church nomination form". National Register of Historic Places. National Park Service. Retrieved 2009-10-15. ^ John Watson (18 July 1997). "Lava Flow Hazard Zone Maps: Mauna Loa". United States Geological Survey. Archived from the original on 15 January 2013. Retrieved 12 December 2012. ^ "Let's Go Hawaii". letsgo-hawaii.com. Archived from the original on 2006-03-21. ^ "Hawaii's top snorkeling spots". lovebigisland.com. Retrieved February 12, 2017. ^ "Division of Aquatic Resources". Division of Aquatic Resources. Retrieved 2018-04-03. ^ "My Little Grass Shack in Kealakekua Hawai`i; Noble's "Hawaiian Favorites"". Hawaiian Music and Hula Archives. Miller Music Corp. 1933. Retrieved 2009-11-23. Wikimedia Commons has media related to Kealakekua Bay. "Kealakekua Bay State Historical Park". official State Park web site. Hawaii State Department of Land and Natural Resources. Retrieved 2017-07-29. Kohala is the name of the northwest portion of the island of Hawaiʻi in the Hawaiian Archipelago. In ancient Hawaii it was often ruled by an independent High Chief called the Aliʻi Nui. In modern times it is divided into two districts of Hawaii County: North Kohala and South Kohala. Locals commonly use the name Kohala to refer to the census-designated places of Halaʻula, Hāwī, and Kapaʻau collectively. The dry western shore is commonly known as the Kohala Coast, which has golf courses and seaside resorts. Puʻuhonua o Hōnaunau National Historical Park is a United States National Historical Park located on the west coast of the island of Hawaiʻi in the U.S. state of Hawaiʻi. The historical park preserves the site where, up until the early 19th century, Hawaiians who broke a kapu could avoid certain death by fleeing to this place of refuge or puʻuhonua. The offender would be absolved by a priest and freed to leave. Defeated warriors and non-combatants could also find refuge here during times of battle. The grounds just outside the Great Wall that encloses the puʻuhonua were home to several generations of powerful chiefs. John Young was a British subject who became an important military advisor to Kamehameha I during the formation of the Kingdom of Hawaii. He was left behind by Simon Metcalfe, captain of the American ship Eleanora, and along with a Welshman Isaac Davis became a friend and advisor to Kamehameha. He brought knowledge of the western world, including naval and land battle strategies, to Kamehameha, and became a strong voice on affairs of state for the Hawaiian Kingdom. He played a big role during Hawaii's first contacts with the European powers. He spent the rest of his life in Hawaiʻi. Between 1802–12, John Young ruled as Royal Governor of Hawaii Island while King Kamehameha was away on other islands. He organized the construction of the fort at Honolulu Harbor. The Hawaiians gave him the name ʻOlohana based on Young's typical command "All hands ". 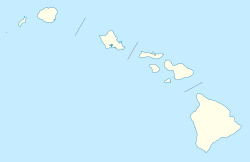 Kawaihae is an unincorporated community on the west side of the island of Hawaiʻi in the U.S. state of Hawaiʻi, 35 miles (56 km) north of Kailua-Kona. Puʻu o Mahuka Heiau State Historic Site on the North Shore of Oʻahu is the largest heiau on the island, covering 2 acres (8,100 m2) on a hilltop overlooking Waimea Bay and Waimea Valley. Puʻu o Mahuka means 'Hill of Escape'. Hawaiian legends have it that from this point, Pele leaped from Oahu to the next island, Molokai. From its commanding heights, sentries could once monitor much of the northern shoreline of Oʻahu, and even spot signal fires from the Wailua Complex of Heiaus on Kauaʻi, with which it had ties. It was designated a National Historic Landmark in 1962, when it became the center of a 4-acre (16,000 m2) State park. It was added to the National Register of Historic Places in 1966. Puʻukoholā Heiau National Historic Site is a United States National Historic Site located on the northwestern coast of the island of Hawaiʻi. The site preserves the National Historic Landmark ruins of the last major Ancient Hawaiian temple, and other historic sites. Kalaniʻōpuʻu-a-Kaiamamao was a Hawaiian monarch, the 6th Aliʻi (chief) of Kohala, 4th Aliʻi of the Kona district and 2nd Aliʻi of the Kaʻū district on the island of Hawaiʻi. He was called Terreeoboo, King of Owhyhee by James Cook and other Europeans. His name has also been written as Kaleiopuu. Mokuaikaua Church, located on the "Big Island" of Hawaii, is the oldest Christian church in the Hawaiian Islands. The congregation dates to 1820 and the building was completed in 1837. The Kuamoʻo Burials is an historic Hawaiian burial site for warriors killed during a major battle in 1819. The site is located at Kuamoʻo Bay in the North Kona District, on the island of Hawaiʻi, United States. Hōlualoa Bay is a historic area between Kailua-Kona and Keauhou Bay in the Kona District of the Big Island of Hawaiʻi. The community now called Hōlualoa is uphill from this bay. 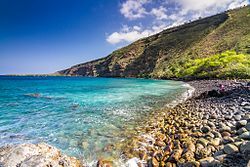 The name means "long slide" in the Hawaiian Language, from the long trail that went from a forest on the slopes of Hualālai, to a site where the logs were made into canoes into this bay where a large royal building complex was built over several centuries. High Chiefess Kapiʻolani was an important member of the Hawaiian nobility at the time of the founding of the Kingdom of Hawaiʻi and the arrival of Christian missionaries. One of the first Hawaiians to read and write and sponsor a church, she made a dramatic display of her new faith which made her the subject of a poem by Alfred, Lord Tennyson. Kahikolu Church is one of only two stone churches from the 19th century on the island of Hawaii. It was built from 1852–1855 on the site of an earlier building known as Kealakekua Church that was built around 1833 in the Kona district. Kaʻūpūlehu is the site of a historic settlement on the west coast of Hawaiʻi island, the largest of the Hawaiian Islands. Devastated by a lava flow, the area is now the home of luxury hotels such as the Four Seasons Resort Hualalai.